For the past few days, South Florida has had some awesome temperatures. Fifties in the nights, seventies in the daytime. I haven't needed to turn on the air conditioning or heat the entire time, which is good for the old electric bill. However, today, while still beautiful outside, took a turn for the worse when I entered my office building. Yep, the air conditioning was on. Our cool building manager told me everything was off, but my hands and shivering body said otherwise. 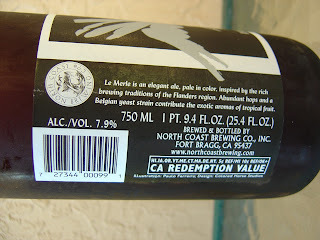 Tonight, as you know, I'm drinking Le Merle Saison brewed by North Coast Brewing Company in Fort Bragg, California. 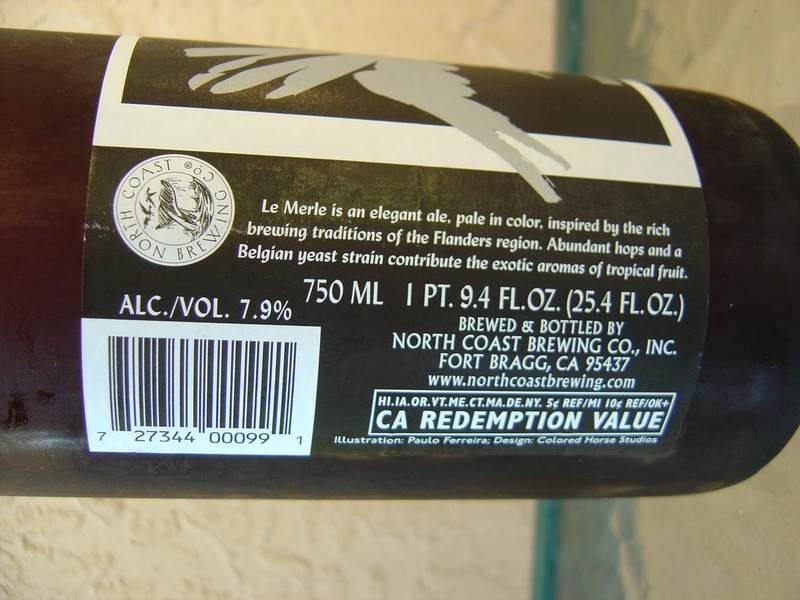 This Belgian Style Farmhouse Ale is part of their American Artisan Series and comes in a corked wine bottle. The contrast of colors is great despite being almost exclusively in blacks and silvers, minus a few golden accents. Nice presentation. It's been quite a while since I've had something new from this brewery. Between Old Rasputin and Old Stock Ale, well those are two splendid beers. Enough said. 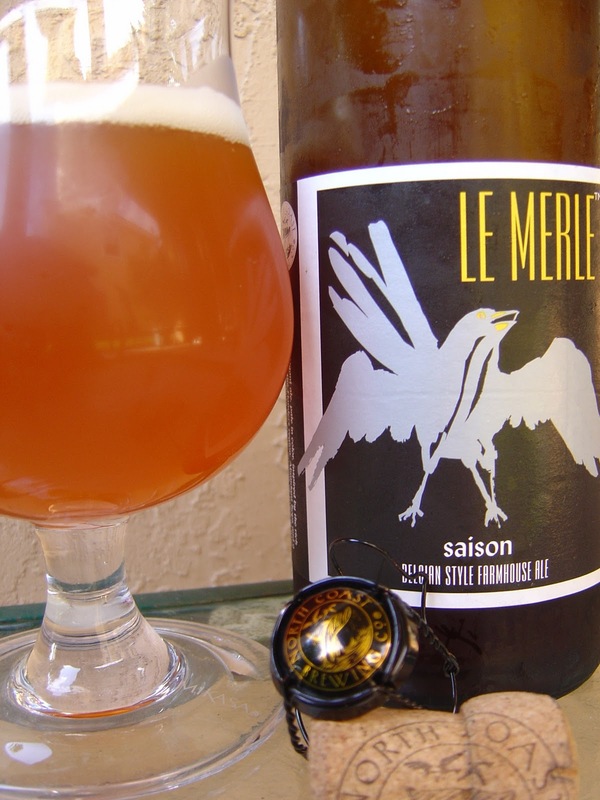 Belgian yeast, fruity apple aroma, lightly sweet, very welcoming. Sweet fruity flavor start as well. And plenty of yeast. Oranges and apples are the main fruits I taste, and they are sweet and not really citric or tropical. Very nice. A small faint funk goes along with the yeast, but really not that much. A hit of coriander and clove spiciness creeps in as well. This is a bit syrupy and chewy and missing a tartness that I was hoping for. Good carbonation. The bottle says 7.9% alcohol which I fail to detect. 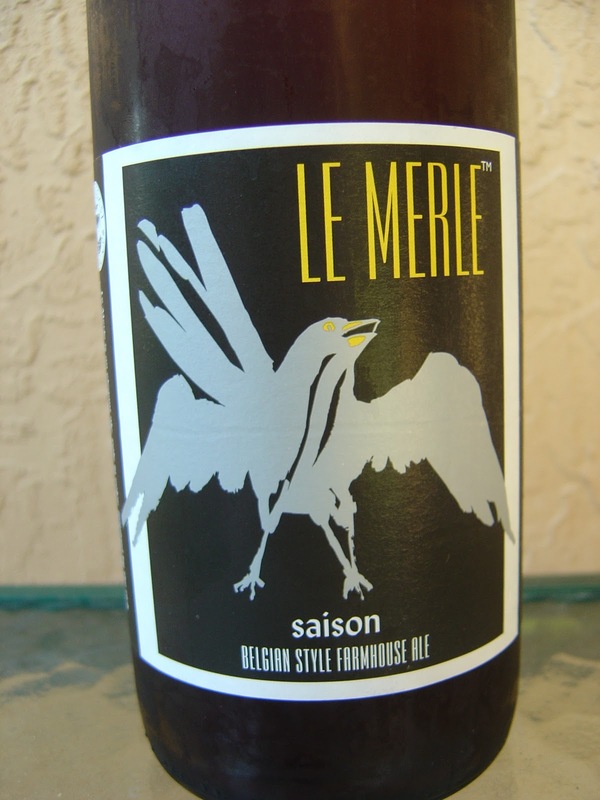 Simple, flavorful fruity beer. Solid Saison! Check it out. I agree it was little low on the tart side, but a delightful Florida fall beer :) Another one with that dangerously hidden alcohol too! Isn't this weather awesome? No doubt, the alcohol was completely masked. 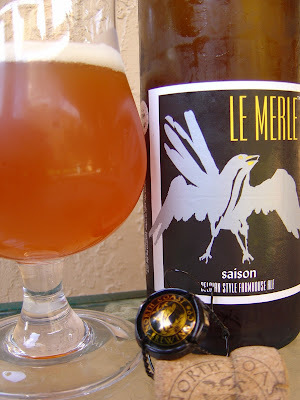 That tart is one of my favorite aspects of this style beer, so I missed that. Anyway, pretty good!